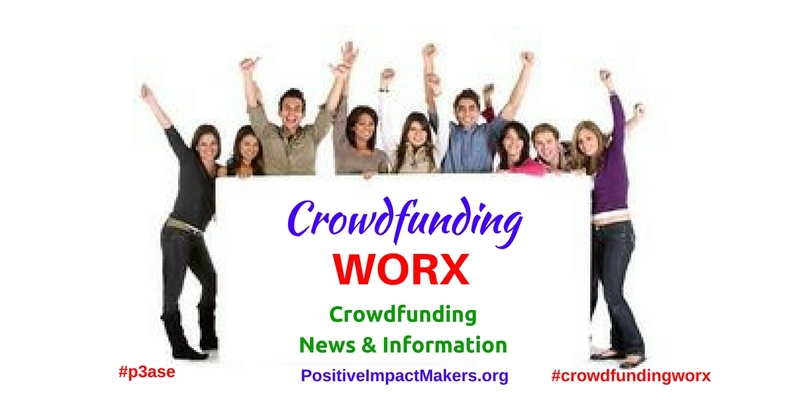 Welcome to the New Crowdfunding WORX News and Information. Our mission is to help you understand more about crowdfunding and how you can possibly use it to further your dream, your purpose, your business, or your cause. Whether you are a for-profit enterprise or a nonprofit organization, our goal is to become your go-to source for some of the latest, greatest, most informative and up-to-date crowdfunding news. How, you ask? How does crowdfunding really work, especially for those who tried it, yet failed? I, like Albert Einstein, believe you must first dream the possibilities, then take action. Some will support you and some will believe you are nuts. If dream is viable and you believe you can succeed, get the support from those you need in your corner and move forward. 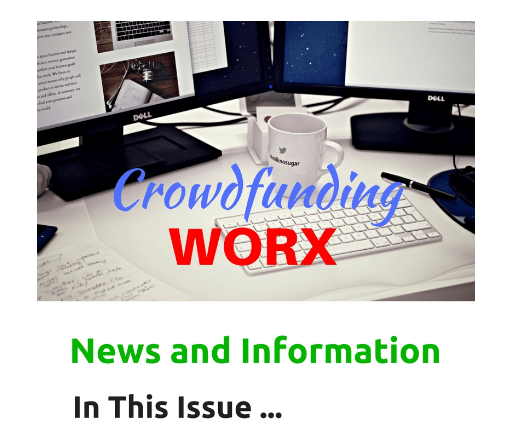 In this first edition of Crowdfunding WORX News, we will answer some of those questions so you can bring your dreams to reality, and we will answer more in future editions. 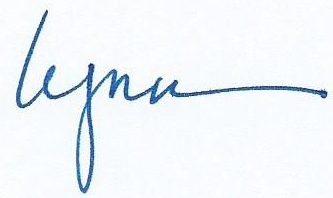 I’m so excited to bring you this new, information and my personal tips for your success. With the help of Linda More, Co-CEO of Positive Impact Makers, and our amazing team, we are here to help. We cannot dismiss or discount the impact on small business that crowdfunding is having and will have going forward. The new crowdfunding legislation will bring even more opportunity for small business, especially with startups. Some of the latest rules for crowdfunding will have a significant, lasting and long-term impact on small business growth and funding. In 2010, in the height of what most, especially entrepreneurs see was the Great Recession, President Obama proposed the JOBS Act (Jumpstart Our Business Startups). This legislation was designed to make it easier for small businesses and start-ups to raise funds. In 2012, Congress enacted the legislation legalizing equity crowdfunding and in May of this year, the remaining part of that legislation went into effect regarding equity crowdfunding. It is officially referred to as Regulation Crowdfunding and it opened the door for all types of businesses run by all kinds of entrepreneurs to raise funds over the Internet. There are certain restrictions, however, this action is a major contributor to the fact that the amount of funds that will be raised during 2016, far exceeds anything imagined. Learn more from this USA Today Article, “How to raise cash for your business online” by Rhonda Abrams, in this special article on the subject of crowdfunding. This Entrepreneur Raised $11+ million thru Crowdfunding – How Did He Do It? Here is a great account of how harnessing the power of crowdfunding, you can reach your business objectives. It wasn’t a trek down the yellow brick road. It was putting into place a viable strategy, and executing it that allowed Hiral Sanghavi to kill it with crowdfunding. Hiral raised more than $11.5 million for a new product and had such a blockbuster campaign, he decided to launch a second product line with crowdfunding. One of the biggest lessons this creative entrepreneur learned is a piece of precious wisdom brought through experiencing the pain of growth. You first must Dream the Possibilities, then Take Action. What are you dreaming and how are you taking action to pursue your dream? We’ve researched fundraising stats are from 2014 and 2015. The results show the numbers doubling and resulting in more than $34 billion raised in 2015, and doubling again for 2016 and 2017. The funds raised from crowdfunding in 2018 are projected to be upwards of $80 billion. Barring you have the right strategy for your campaign, you could claim some of those funds for your own purpose, project, passion, and plan. 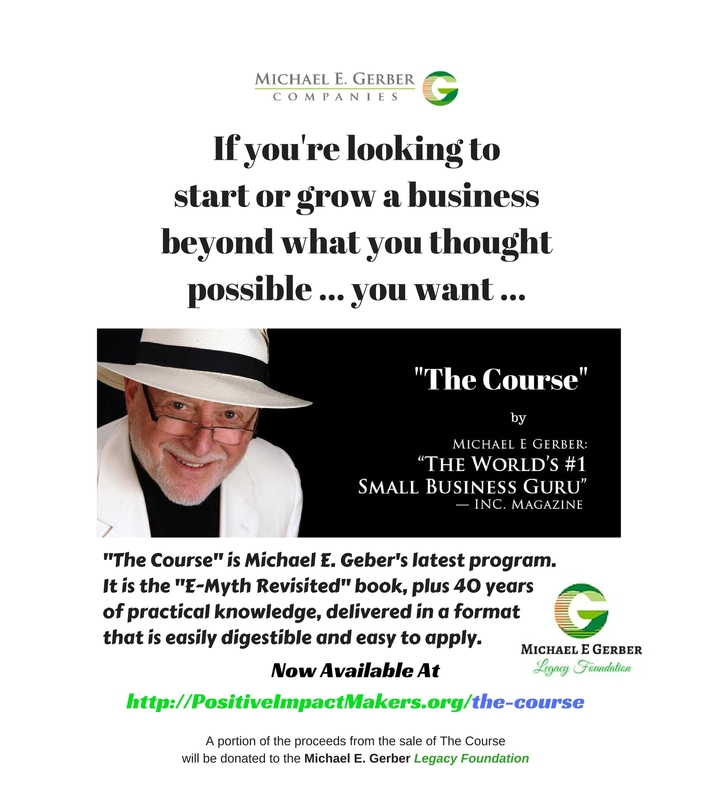 Michael E. Gerber, author of “E-Myth Revisited” is called “The World’s #1 Small Business Guru” and is not only a teacher, but an advocate for your small business success. Didn’t realize that crowdfunding was an option for you or your business? In these bi-weekly issues, you will find out about numerous ways of raising funds, including how you can use crowdfunding if it does work for you. Thanks for being here with us and stay tuned for more! If you’re an author with a book in your heart and mind, have a product or invention, or a health related cause, crowdfunding may be the answer. With crowdfunding, you can get your message out and make a bigger impact in the world. There are those who need you and what you bring to the light. Is it a no-brainer to select a raise amount, or is it something that requires thought to build a strategy around? Choosing the right raise amount is a balance of two factors – setting a number that is high enough to achieve your stated goals, but low enough that you are confident that you can reach your goal. How do you determine if you have selected the right amout? Instead of trying to raise one round of capital to cover every conceivable cost, it’s better to focus on just enough capital to reach your next major milestone. The good news is that even at a smaller number than the full goal amount, you can always raise more than your milestone goal. Because of that reality, focus on reaching your milestone goal in such a way that allows you to achieve even greater than your goal. Lastly, create your marketing strategy and select your platform just as wisely. 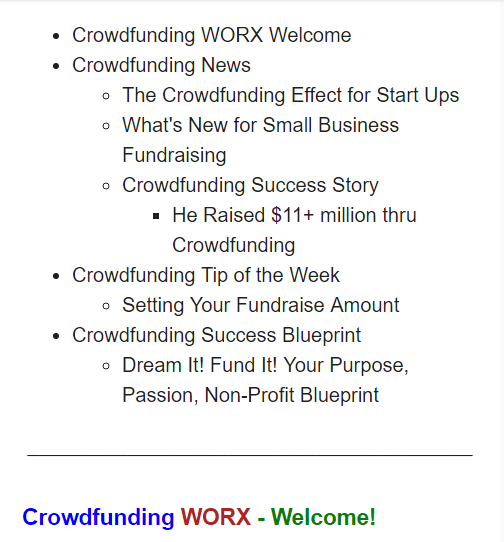 I will address these items in an upcoming edition of Crowdfunding WORX News and Information. Building a strategy and executing your plan for a successful crowdfunding campaign comes with knowing 5 very important, no, essential steps. One of those steps is what I call “The 4 Fs of Crowdfunding” and I’ll be teaching those in a series of short video trainings over the next few days. I’ll also get into the importance of selecting the right platform and 3 ways you will know you’ve got the best solution. Position yourself to get this information. It could be the key to you getting funding for your business, passion, purpose, or cause that you don’t have to pay back. Join us and I look forward to seeing you on the other side. 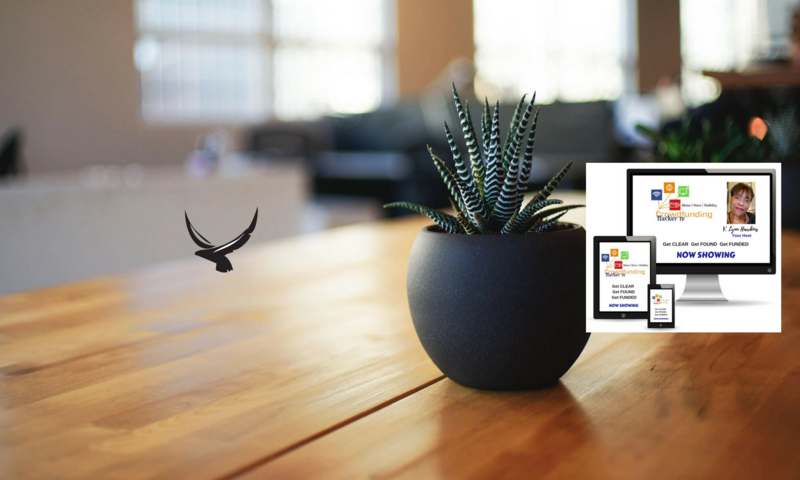 Crowdfunding Hacker is a coaching & consulting enterprise, helping entrepreneurs grow rapid, sustainable business using innovative strategies and funding options, including crowdfunding & equity crowdfunding.